Fullerton, CA – FNU beats Hope International University and returns from golden state with 3 more victories in the record. The match started really hard and after just 5 minutes of play (The Royals) Hope International University scoring a beautiful goal off a free kick from the 25 yard line with Jhon Mejia. The Florida National University pressed the royals and ended up scoring the goal in the 35th minute of the first half with Martin Marijuan assisted by Vinicius Costa. Saturday’s meeting was the first all-time between both programs. 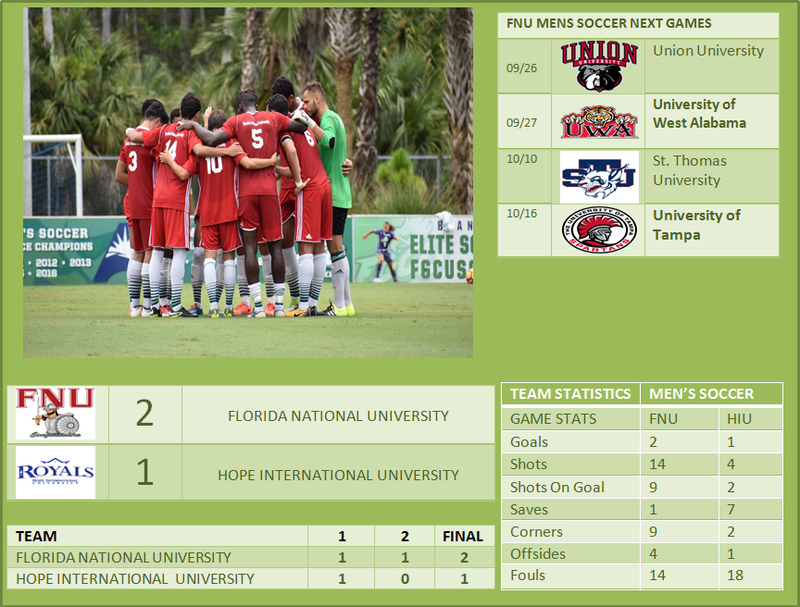 FNU MEN’S SOCCER takes the weekend off before returning to play on the road next Wednesday at 7 p.m. against the Union University at Jackson, TN. For complete coverage of the action, visit the schedule or follow the Conquistadors on social media.